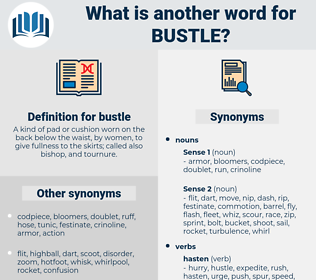 What is another word for bustle? 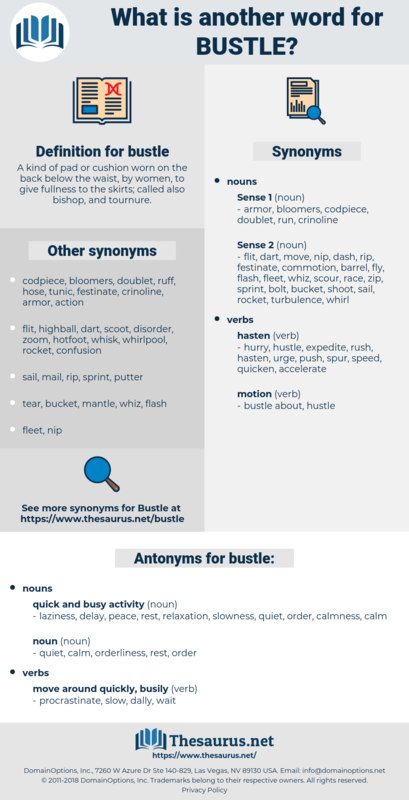 A kind of pad or cushion worn on the back below the waist, by women, to give fullness to the skirts; called also bishop, and tournure. were on pins and needles. calmness, delay, laziness, relaxation, slowness, peace. quiet, calm, orderliness, rest, order. There is a bustle and life about Melbourne which you altogether miss in Sydney. What she did was well and thoroughly done, but not even the example which surrounded her at Orchards Farm could make her in a bustle.